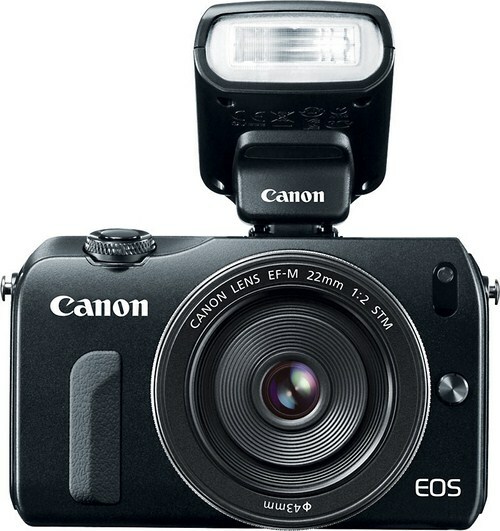 EOS M has Canon wireless flash control, but no HSS? Canon's new EOS M mirrorless camera can control off-camera Speedlites, but does the included 90EX have high speed sync? Canon have brought out a compact mirrorless camera with interchangeable lenses. It’s called the EOS M and has an APS-C size sensor with chunky new lenses in a similar style to the Sony NEX series. Unlike the NEX cameras, though, the EOS M has a full size standard hotshoe. What flash capabilities does this little shooter have? Included in the £769 EOS M kit you will get the new miniature flashgun, the Speedlite 90EX. On its own it’s little more than compensation for the lack of a pop-up flash in the M body. The 90EX’s guide number is just nine (yes, 9) with no tilt, swivel or zoom. But dive into the touch-screen camera menus and you’ll find it can act as an optical Transmitter for your EX-series flashes. The Speedlite 90EX can control up to three groups of wireless flashes with ratio control (1:8 to 8:1) in 1/2-stop increments. The range is puny though – just five metres (16.4 feet) indoors and seven metres (23 feet) outdoors. You can put a 600EX on top to boost this throw, but your set-up will become very top heavy for only a few extra metres range. If all you want is off-camera E-TTL for a single flashgun, why not consider a ten-metre TTL cord? As long as you don’t trip over it, it’ll give you more range (on paper) and won’t be daunted by bright sunlight. The Interfit Strobies 10m cord can be yours for £50 (or $50 in the States). The specified X-Sync for the EOS M is 1/200 second but it hasn’t been confirmed whether or not you will be able to enable high speed sync (HSS) to use flash all the way up to 1/4000 second, the M’s maximum shutter speed. The specifications for the Speedlite 90EX do not mention HSS, so you might have to do without if all you own is the basic kit. The full size hotshoe on the EOS M means you can mount any flashgun or accessory you like, whether it comes from Canon or not. Sony should take note. The Speedlite 600EX-RT and ST-E3-RT are supported, so good news for anybody with the dosh to invest in Canon’s proprietary radio system. No news yet on whether third party TTL triggers such as the Pixel King, Phottix Odin and Yongnuo YN622C will work. On the other hand, why have all this heartache over flash when continuous lighting will do the job? The stereo microphone, 3.5mm input and full HD recording suggest that Canon have geared this camera up to shoot video quite capably. With its modern APS-C sensor, low light performance shouldn’t be too bad in stills mode either, so just grab some new LEDs and flash syncing is a thing of the past. Always-on lighting will help the autofocus system along and give you a better preview on the rear LCD (as there is no optical or electronic viewfinder). Plus, with continuous lighting there is no top sync speed. There is still something missing though: WiFi. Unless you use an Eye-Fi card (a 3rd party solution) for your wireless tethering, you’ll have to turn to Samsung for a camera with proper connectivity – something that InfoTrends says should be a standard feature in 2012’s releases. Once you’ve seen a camera with WiFi in it, why would you accept one without it? But apparently you still need to bring along a chunky laptop or wait until you get home to share your EOS M photos. And the elusively smoky Polaroid SC1630 is the only camera thus far with downloadable apps. Pre-ordering is open now. 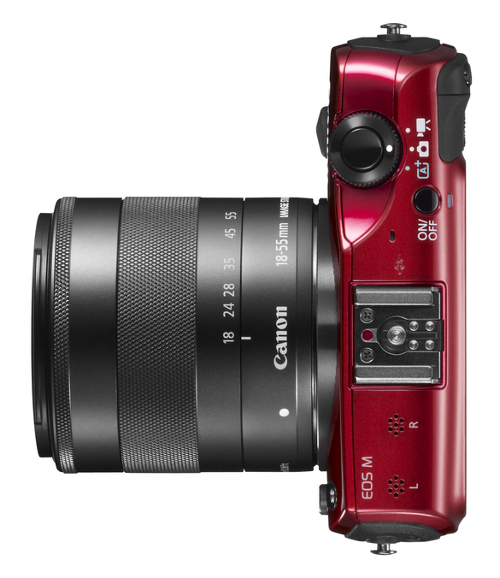 Canon EOS M kits start at £769 in the UK and $799 in the USA. Note that in the American bundles, you get a different lens and a flashgun isn’t included, so you have to buy the 90EX separately for $149. Do you like the new Canon EOS M? Yes, but I already have a mirrorless camera. Yes, but it's too expensive right now. No, I will look at alternative mirrorless options. No, I am not interested in mirrorless cameras.